First Division Morton have signed striker Iain Russell from Brechin City for an undisclosed fee. The 24-year-old, who was last season's the Second Division player of the year, has signed a three-year contract. The Cappielow side have also signed Michael Gardyne on a permanent deal from Celtic. The midfielder, who was coached by Morton manager Jim McInally for Celtic's youth teams, spent time on loan at Ross County last term. Russell has scored six goals in four games this season for Brechin for a total of 35 goals from 34 appearances for the Glebe Park club. 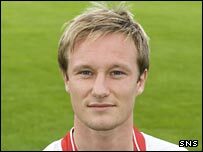 The striker, who began his career with Rangers before moving to Motherwell, joined Brechin from Dumbarton in August 2006.